Before Eye P.A., professionals navigated through dense streams of packet data looking for a needle in a haystack. Now they have a first step to better understand Wi-Fi networks - visually. Eye P.A. converts raw wireless packet data and transforms it into a colorful multi-layer pie chart. Many times, IT professionals know there is a problem with their wireless network, but don't know what is causing it. 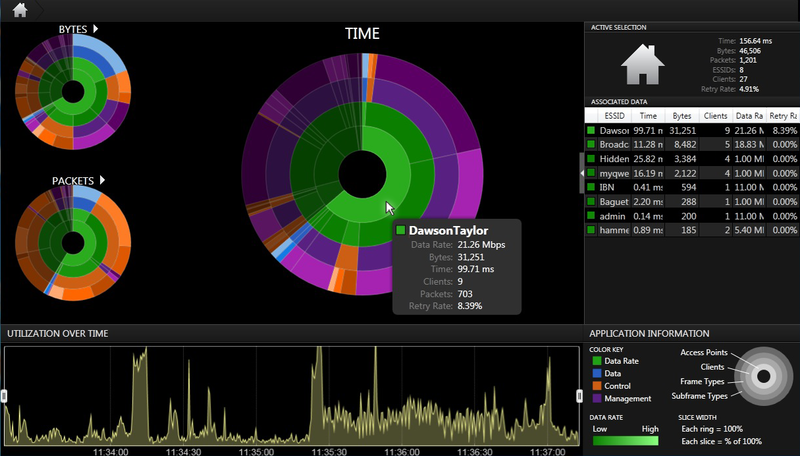 MetaGeek announced the availability of its latest software visualization tool, Eye P.A. Eye P.A is 802.11 packet capture visualization software designed for wireless professionals and all those that are interested in seeing their wireless network data in a whole new way. It helps find top talkers, analyze network conversations, diagnose network health, monitor retransmits - identifying issues quickly with color. “Eye P.A. is our latest innovation. We want to provide beautiful data visualization to the world of Wi-Fi packet analysis, combined with the same ease-of-use that Chanalyzer has brought to spectrum analysis. Eye P.A. will parse a wireless packet capture file and aggregate the data into easy-to-understand color coded multi-layer pie charts - or treepees as we call them around the office” said Ryan Woodings, Chief Geek at MetaGeek. Crunching the numbers, Eye P.A. turns raw packet capture streams into interactive visualizations, organizing the packet stream into conversations between clients and access points. It then sorts the conversations by bytes, packets and air time, making it easy to drill down to see more information and diagnose network issues. Many times, IT professionals know there is a problem with a wireless network, but don't know what is causing it, making it difficult to track down in traditional packet analysis products. With Eye P.A., once they have narrowed in on the issue, our built-in “export to Wireshark” feature can be used for packet-by-packet analysis. “There are too many times that I find myself troubleshooting an issue blindly. I’ll open up Wireshark and scroll until I find something interesting. With Eye P.A., I can see the channel as a whole - with all of the traffic from competing access points. I can then monitor issues from a single AP. If I don’t notice anything, I’ll move to the client layer,” said Trent Cutler, Jedi Trainer at MetaGeek. Eye P.A. is the first-step to understanding Wi-Fi network. Eye P.A. is now available for $499 (including one year of software maintenance) at metageek.com/eyepa.